Although Sony announced huge losses for its mobile division and its availability for partnerships with other companies, its roadmap for this year includes several smartphones and one or more tablets. We've already seen Sony's first smartphone launched this year, the Xperia E4, which is a low-end Android handsets, but more devices might be announced next week at Mobile World Congress 2015 trade fair. Now XperiaBlog has just received evidence that Sony plans to launch a new tablet next week, which will most likely be showcased at MWC 2015. The unannounced Sony Xperia Z4 Tablet is the sequel to the Xperia Z3 Tablet Compact. The slate is expected to pack a larger 10-inch display and a more powerful processor. The Xperia Z3 Tablet Compact is already a more than decent slate, but the Xperia Z4 will aim the high-end range. 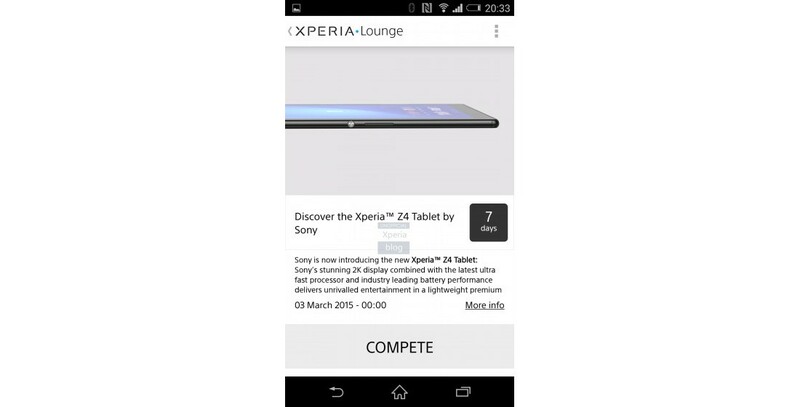 The new tablet hasn't been confirmed by Sony yet, but it briefly appeared in the official Xperia Lounge application. Someone was able to take a screenshot showing the Xperia Z4 Tablet before Sony pulled the advert, so we now know a little bit more about what it will look like and what specs it will pack. The most important seems to be the “stunning” 2K display, which is combined with the “latest ultra fast processor” and “industry leading battery performance.” These features have been confirmed as part of Sony's Xperia Z4 Tablet, but aside from these there aren't any other details on the slate. The rumored specs include a Snapdragon 810 processor, 4GB RAM, 13MP rear camera and 8MP front camera. Design-wise, the Xperia Z4 Tablet looks very much like the predecessor, the Xperia Z3 Tablet Compact, but with a larger display. The power on/off button remains on the mid of the right side for easier access, while the volume key is right above it. That's about all we get from the screenshot taken inside Xperia Lounge app, but the good news is we might not have to wait too long for the tablet to go official, as Sony has already confirmed a launch event for March 2.